On October 21, Andrew Howard, one of the two people behind Team Better Block, visited Albuquerque. Contact with Andrew was initiated through a tweet from Tim Trujillo which manifested into a visit through the efforts of many. Former City Council Roxanna Meyers and the University of New Mexico School of Architecture and Planning both contributed money towards bringing Andrew to town. Mr. Howard was brought in to look at various parts of urban central Albuquerque and identify a segment of town which is on the cusp of success but could use a bit of boost. Watch the video below to see the work that Team Better Block does. The morning began with a breakfast at Flying Star on Silver & 8th St. Tim Trujillo, Rick Renne of the Downtown Action Team, Mark Childs of the UNM School of Architecture, Andrew Howard and I were present. At breakfast we learned more about Andrew’s background and his experiences with H-GAC (the Houston, TX equivalent of MRCOG) and Kimley-Horn, a multinational engineering and planning consulting firm. The public process he observed while working for these organizations was so discouraging that he decided to try something different. This led to his collaboration with Jason Roberts and the birth of Team Better Block in Dallas, TX. After breakfast, Tim, Rick and I gave Andrew a tour of some important portions of Downtown including the Gold Ave. Lofts, the Sunshine Block and the Alvarado Transportation Center. Tim and I then directed Andrew around Barelas with a focus on the Railyards and 4th Street, including the iconic Arrow Supermarket. Next on the list was EDo: East Downtown / Huning Highlands. In EDo, Andrew told us he was looking for something more “gritty” and “authentic”. In his mind, EDo has already “made it” (did you hear that Rob Dickson?!) and he wanted to see a place that hadn’t quite “made it” yet. When Andrew made these comments, I immediately thought of the International District. In my mind, it has the right bones which would allow it to become an “art district” of sorts. However, the last area we had time for was North 4th / Mountain, including Marble Brewery and some of the warehouses in the area. 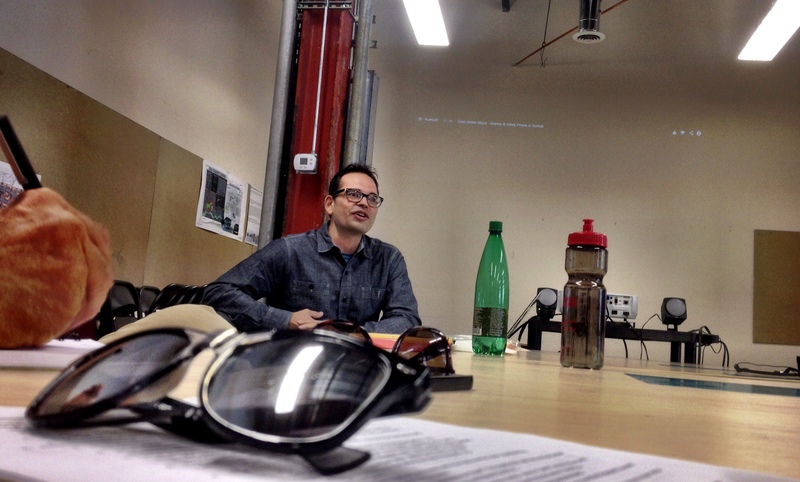 The next agenda item was a brown bag lunch hosted by Micheale Pride of the UNM + CABQ CityLab space. Important local players in attendance included city traffic engineer Crystal Metro and Linda Rumpf who works for the Office of the Mayor and ABQ: The Plan. We began with a short video about some of the recent work done by Team Better Block in Norfolk, VA. After the video, people started to talk. Sammantha Clark vocalized the difficulty of getting land owners to open up buildings for these types of events. Andrew responded by noting that insurance for a Better Block event must be included as part of the price tag. He says that owners tend to loosen up as planning for the event accelerates. When landowners observe the momentum, minds change. Mr. Howard also emphasized that with difficult property owners, you have to begin by just asking to get inside the door. Don’t overwhelm them with event details immediately. The discussion continued into debate about the parklet/parquito program which is currently being pursued by ReUrbanate ABQ. We learned that Lobo Scooter “buys” the parking space in front of their store to display scooters everyday. Who is to say we couldn’t do this for a parklet or some type of art installation on the day of the event? Linda brought up the importance of Route 66 in regard to any proposal or plan. I asked Andrew who we can look towards regionally for inspiration. Andrew mentioned Denver but regarding a city our size, Fresno, CA was the best example he could think of. I don’t think the next generation is going to put up with it. The International District was brought up when Michaele informed the group of the place-making process occurring in the district. Little Globe, UNM, AMAFCA, CABQ and many others are collaborating on place-making through art in this historically poor and ignored segment of the city. Michaele also explained how East Central Ministries is a major umbrella for positive grassroots advocacy efforts in the International District. They are planting seeds for a better future in the area. Andrew’s presentation later that evening featured a similar organization in a poor part of Dallas which led a successful Better Block effort. The pictures reminded me of the International District. Jason Roberts of Team Better Block in action! 3-4 months – develop a plan. In order to make it viable, there MUST be a strong a champion from the area to push it forward. 1-2 major property owners on the block must be on board. At the same time, set a date and publish it! Andrew emphasized the need to “blackmail yourself”. It forces people to commit. The corridor should have a design speed of 25 MPH or less. That’s the threshold speed for a successful project so on the day of the intervention, create a streetscape that has these design speeds. 1 month – Begin the pop-up shop application process. Initiate walk thru of the buildings you want to “occupy” on the day of the event. 2 weeks out – Begin the pre-build. Acquire materials, talk to players you want involved, hash out the details. Clean up the retail spaces and ready them for occupation. Day of – Start early and get those boots on the ground. The rest can only be determined by the community. 1 month after – Show up at City Council with a list of local zoning codes you broke in order to make the event happen. 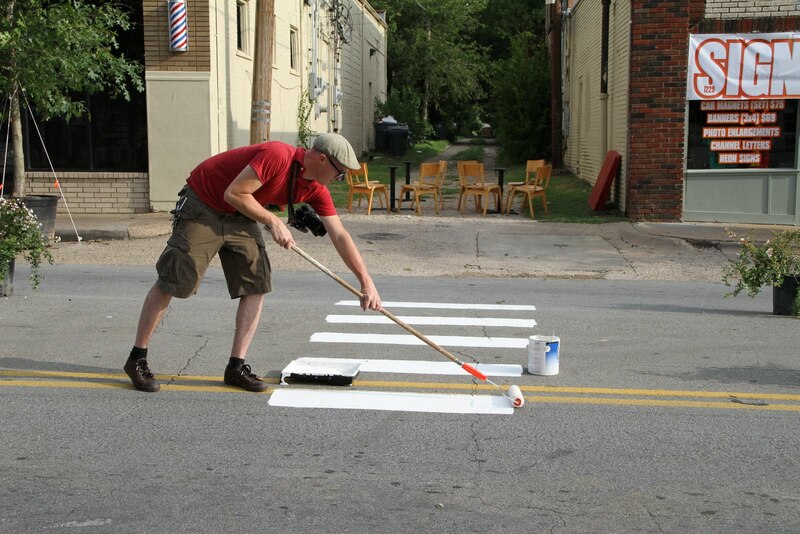 Come to them with stats about the success of the event, how great traffic calming is, etc. It will be a hard argument to reject. City staff meeting. 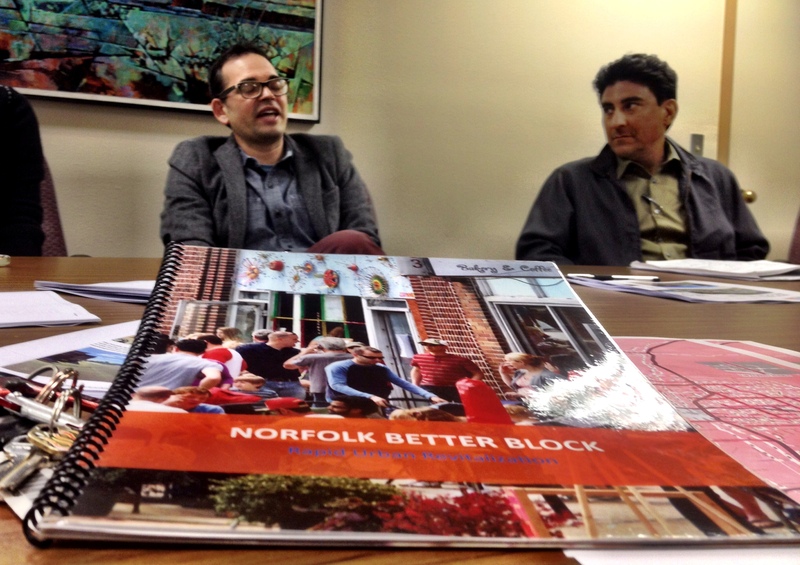 The book in the foreground is a report from a successful project in Norfolk, VA. The next agenda item was a meeting with members of city staff. The diverse group of attendees included, but was not limited to, Andrew Webb, Roxana Meyers and Russell Brito. Regarding the success of doing a Better Block project, Andrew emphasized the importance of champions vs. cheerleaders. In the Better Block project area, there must be someone who is passionately interested in the potential of the neighborhood. A cheerleader is extremely supportive but a champion will live and die for the block. The best example of a champion in Albuquerque is Rob Dickson. His unwavering passion for the creation of a stronger East Downtown (EDo) has led to a successful transformation of Central between Broadway and I-25. Another element of a successful Better Block is a 50/50 mix of vitality and abandonment. Selecting a completely decrepit area is not recommended. You need people occupying a given area (a block “anchor”). These existing tenants see the potential for the block and are therefore generally supportive of the event. Mr. Howard also explained the most importance part of the Better Block process: the 30 days after. In those 30 days, data and information must be processed and presented to city staff. It is generally presented with zoning change recommendations. At the first Better Block, Jason and Andrew had giant posters in the windows of buildings explaining which rules were broken to create the Better Block! When city staff saw these posters, a positive community conversation began. Eventually, the talk turned to Downtown and why it has struggled over the years. Andrew went around the table, asking each person a question which then led to another question for the next person around the table. Andrew concluded by asserting that Downtown struggled because it was not treated like a neighborhood. We then discussed a variety of other items such as the difference between a special event vs. a pilot project vs. a permanent project. Mr. Howard also emphasized the importance of keeping the scope of Better Block small in order to make it successful. In this meeting, we also learned about a strong relationship between Better Block and the National Association of Realtors. It has facilitated multiple successful Better Block projects. In the evening, Andrew presented his story to a relatively full house in the Garcia Auditorium @ George Pearl Hall, UNM S-AP. Michaele and I explained to the audience the process of getting Andrew here and then let him do the rest. For me, it was the least exciting and most relaxing part of the day. At the same time, it was good opportunity to reflect upon the conversations we had over the course of the day. Context sensitive design: be conscious of the place you are designing for. Duct tape: the most important tool in the toolbox. Temporary can be powerful. Break all of the rules and do it publicly! Make sure people know which rues you are breaking. Better Block is fun but it is NOT a party. Collecting data = potential for long-term change. Tell the story of the place. Every place has talent and resources. Sometimes, the place just needs to be looked at differently / appropriately. The world is a stage and Better Block is an act of improv. After the presentation, Mr. Howard walked into the audience and conversed with many of the attendees. Many of us left the presentation fired up and filled with ideas. Mr. Howard left Albuquerque, NM the next day to speak at a conference at MIT. Gold Ave. Downtown between 2nd and 4th. The built environment on the selected segment is ideal: walkable building stock + healthy mix of occupation and vacancies. 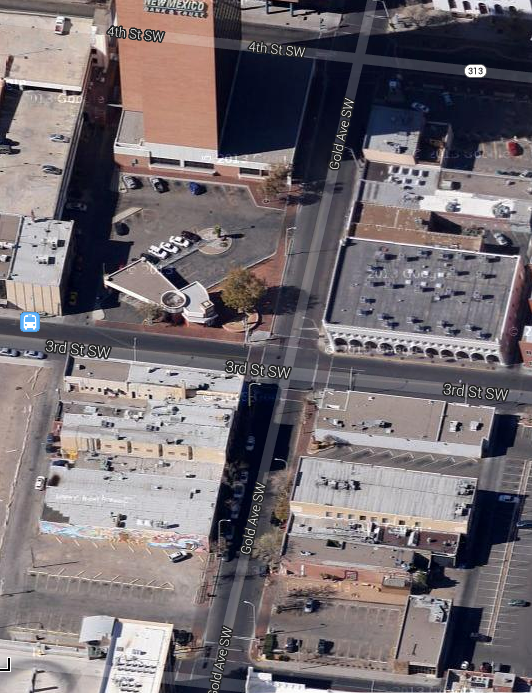 This segment of Gold is also the proposed location of the first parklet/parquito in Albuquerque. There are plenty of natural partners on the segment, including Café Giuseppe. The right of way is 55 ft. It allows for the possibility of using the street differently. Regarding the first Burque Better Block project, I am planning a larger event. 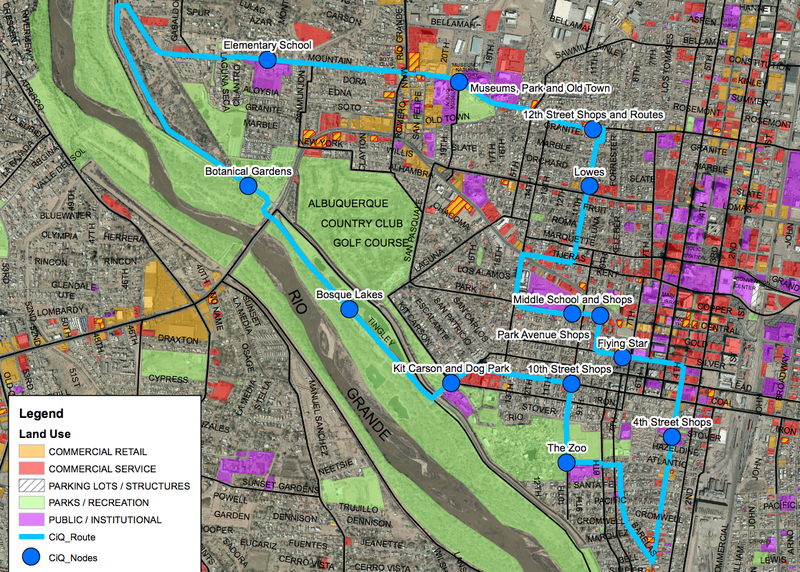 I have begun the planning process for a ciclovia/open streets event in Albuquerque. It will be called CiQlovia (Q for ABQ) and it will incorporate elements from Team Better Block. At this point, the draft route includes Silver but we are looking at using Gold instead so we can have Better Block elements integrated into the event. Currently, my team and I are in the early stages of the planning process. We have selected a draft route, pictured below, and and we are aiming for one of the four Sundays in September. It includes Downtown, Old Town, Barelas, the Bosque and other amazing neighborhoods in the historic core of Albuquerque. This map highlights the proposed route as well as land uses along the route. CiQlovia will require a massive team of volunteers as well as funding. Once we acquire our special event permit at the beginning of the year, we will begin seeking out members of our community who would like to be involved. We are looking for food trucks, yoga teachers, natural healers, philanthropists, artists, muralists, craftspeople, bicycle repair experts… well, let’s just say this will be like nothing Albuquerque has ever seen. Supported by the Complete Streets New Mexico Committee, the Healthier Weight Council, the Downtown Neighborhood Association and the City of Albuquerque, CiQlovia will promote the use of our streets, our largest public space, for something other than moving as many automobiles as possible. Streets are closed in Albuquerque for races, parades and shopping events. CiQlovia is about just being in the street. It is about providing a safe place for people to walk, bike, rollerblade and exercise, fresh air. More than anything, it is a statement about the relationship between our built environment and the obesity crisis. Keep following UrbanABQ.com for updates on this event.